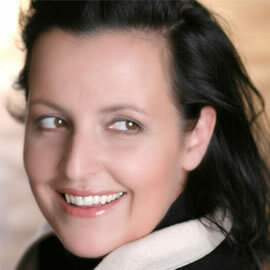 Brünnhilde in Wagner was the Austrian soprano Brigitte Pinter. 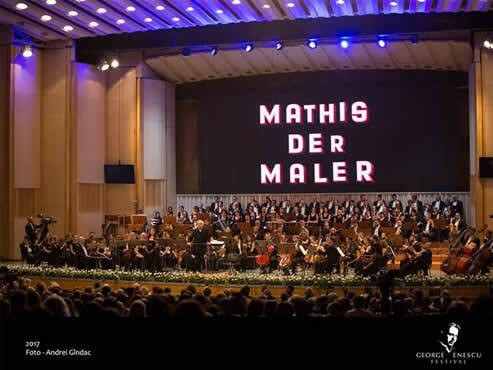 First a mezzo soprano she made her transition to the dramatic soprano (such as the recently deceased Janis Martin, who distinguished herself in the great Wagnerian and Strauss roles, such as the still young Pinter has been doing). Miss Pinter came to Porto for the first time. 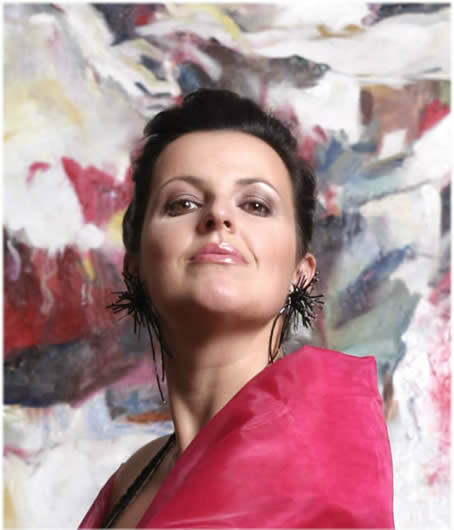 (In 2007 she sang in Lisbon the diptych Sancta Susanna / Erwartung and Marie in Bergs Wozzeck) - she worked with Rundel in 2012 in the Ruhr Triennale, in a production of Prometheus, Orff - and left us with the desire to be heard again soon around here: her beautiful mezzo timbre gives a solid support to the texture and color of the the middle register. Her high register is beautiful, bright and firm and, with age, will still win in dramatic penetration. As for the physical and histrionic presence, she is already incredibly charismatic. 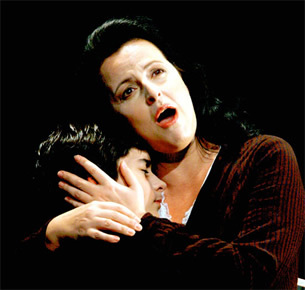 Pinter is a dramatic soprano that we can count on in the future! echte Liebe erleben lassen, dafür mehr Brutalität welcher sie bis dato nicht entrinnen konnte. Miss Pinters Debut as ISOLDE in Wagner’s Tristan und Isolde at Teatro La Fenice for the opening of the International Wagner Year in a new production with Maestro Myung-Whun Chung and Paul Curran was highly acclaimed by press and audience. Nevertheless this Tristan may be called a sensation because of the young,promising phenomenal Isolde-debutante Brigitte Pinter. Isolde was brilliantly performed by Brigitte Pinter, powerful, intense, tragic, beautiful, she is a driving force with a fascinating interpretation. less than a personal triumph. Brigitte Pinter was awarded the special honorary price of the Carl Orff Foundation for her outstanding artistic performance. 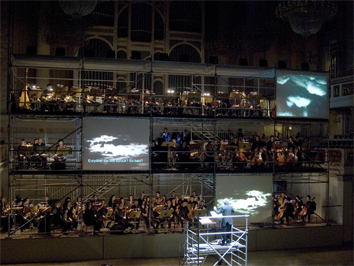 In a new Production of Arnold Schönbergs "Erwartung"
at the Konzerthaus in Berlin. Press and audience were thrilled by her performance. 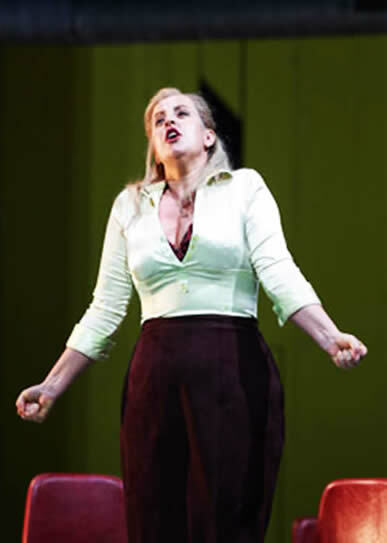 Brigitte Pinters rich soprano as Eurydike (alias Alma Mahler) owns thrilling high notes as well as expressive, almost existential force without loosing her clear diction. 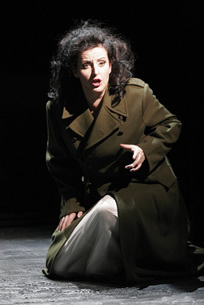 Brigitte Pinter, who had studied the role just in a few days, sang with great vocal beauty and warm, lyric emphasis. "She was utterly aware of what she was singing, she was dramatic without forgetting to be musical. She chilled the audience to the bone..."
at Teatro La Fenice in Venice. 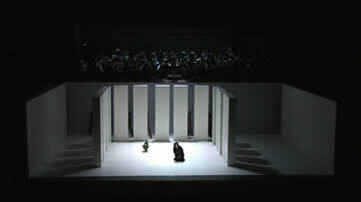 Future plans include Isolde and all three Brünnhildes in Wagners Ring, Salome, Färberin as well as Turandot. One of the stars most shining in this luxurious cast is Brigitte Pinter, a voice of great international successes “discovered” by Maestro Claudio Abbado. 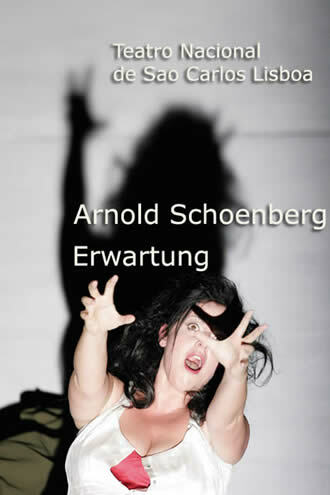 In Portugal, in Sao Carlos, she already showed her class in a most demanding soloperformance: Erwartung by Arnold Schoenberg. 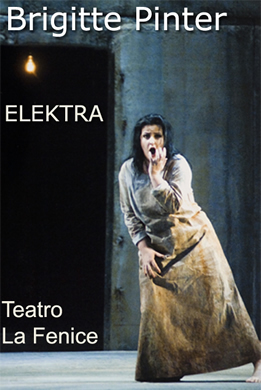 She debues as Marie in this Wozzeck. According to the stage director she is “less the insane person on stage but much more close to our- the spectators- inner world. This Marie of Brigitte Pinter was simply outstanding. She is clearly approaching the register of a dramatic soprano and moving away from the mezzo sound. Notable her diction, notable the insight and the art of the “Sprechgesang” sections, notable the ease of articulation in a role that reaches from a contra e up to the high c’’’, with phrases that expand into two and a half octaves, for example the “mirror piece”, demanding “molto leggero” and it really was “molto leggero”. In combination with Pinters portrayal of the part she demonstrates professionalism and most serious dedication to the work. and she also produces fascinating high notes in the hour of truth. one can clearly perceive that she is not only an excellent singer, but also a true actress. in the effort to serve the ambitious demands of the staging (immaculate mother/prostitute). A woman, lost in a dark forest, at night, waits for the beloved one. In her delirious walking she recognizes his body: he is dead. Dead himself or dead their love? Maybe he is only absent? We do not know, we will never know, we know only that she loves him. Is it reality or hallucination? 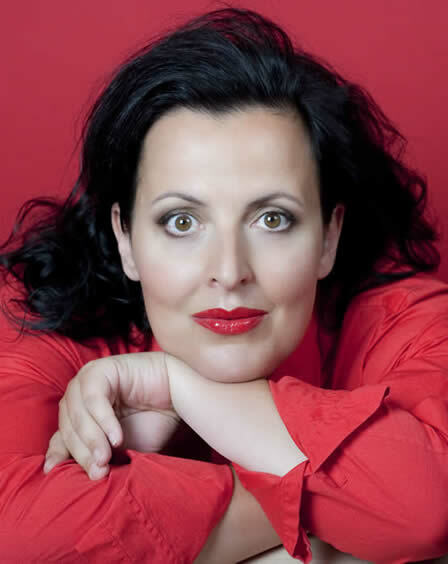 Brigitte Pinter, Austrian Mezzo Soprano, was excellent. It was her first time to perform the role. She is a mature actress with a full-bodied voice which is even throughout the entire range. She offers luxurious low notes and tremendous high notes full of body and strength, and is capable of the utmost delicate pianissimi in all ranges mixed with explosions of strength. 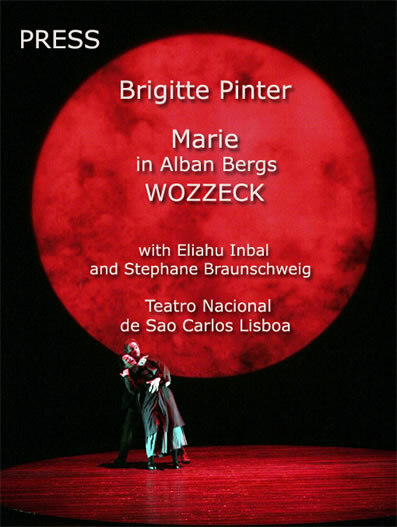 Brigitte Pinter showed a perfect intonation and a clear vibrato without exaggeration. The technical aspects of this role are very challenging but the most important fact about Pinter’s performance was her capability of expressing all the different emotions contained in the part. 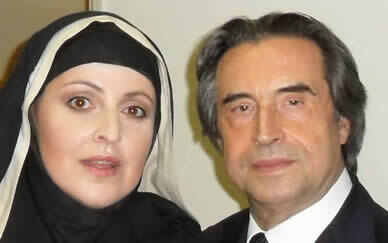 "Pinter already announced her class as Sister Klementia in Sancta Susanna of Hindemith"
Moved by the shroud of the previous scene, Brigitte Pinter, who was highly anticipated, was an astonishing singer and actress. 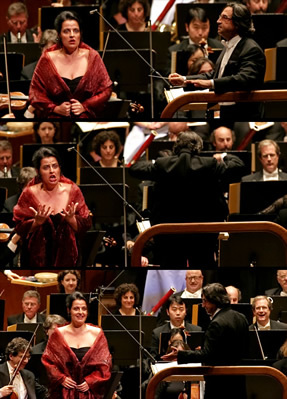 She has amazing high notes, that the role requires, but also ease both in the "Sprechgesang" parts and in the dense low notes of her almost contralto beautiful timbre. A fantastic singer and an extraordinary actress. 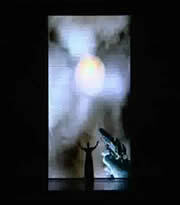 I'll never forget the hallucinating eyes of Brigitte Pinter at the end of the opera"